The move follow warnings from a visiting delegation from the European parliament that the EU will consider imposing sanctions against top Maldivian officials if the government does not release “political prisoners” and convene “genuine inter-party talks” with an international mediator if required. President Abdulla Yameen has decided to invite political parties for talks with the government amid growing international pressure to resolve a year-long political crisis in the Maldives. President Yameen has decided to relaunch the political party talks. Invitations for parties will be sent out by President’s Office. “That dialogue cannot take place whilst political leaders are in detention. All leaders should be free to engage and the public must be informed,” said Richard Howitt, MEP and vice president of the delegation. 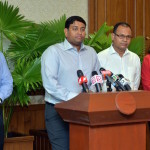 Negotiations between the government and opposition parties in July last year had failed to secure the release of jailed politicians, including former Defence Minister Mohamed Nazim and former President Mohamed Nasheed, whose imprisonment in early 2015 triggered the ongoing crisis. 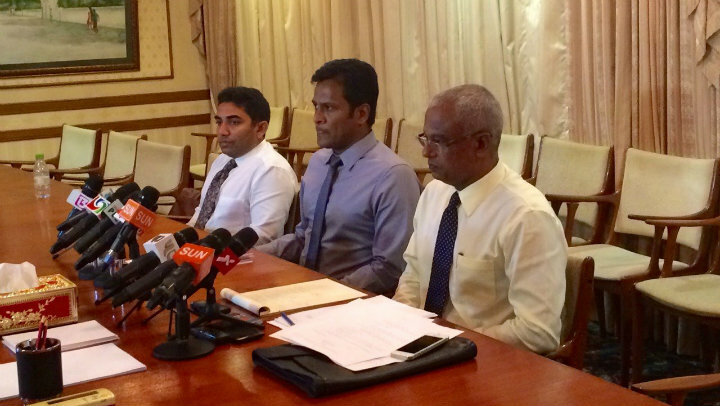 The main opposition Maldivian Democratic Party withdrew from the talks after Nasheed was taken back to Maafushi jail on August 23. 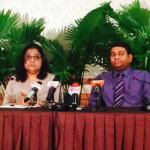 The party accused the government of reneging on commitments to release the opposition leader. 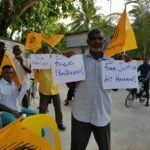 The MDP had ceased street protests and backed the government in several crucial votes in parliament in exchange for Nasheed’s freedom. 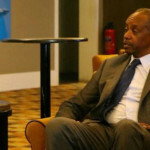 The government invited the allied opposition parties for official talks two weeks after a historic 25,000-strong anti-government demonstration on May 1. Adhaalath Party president Sheikh Imran Abdulla was arrested on the night of May 1 and is now on trial on a terrorism charge. He is accused of inciting violence at the May Day rally. He was abruptly taken back to jail earlier this week after nearly four months under house arrest. The religious conservative party had previously refused to join talks with the government in the absence of its jailed leader. Yameen’s administration was besieged by multiple political crises in 2015, but had remained defiant in the face of opposition protests, international criticism of Nasheed and Nazim’s rushed trials, and mounting diplomatic pressure. 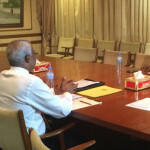 However, faced with the threat of sanctions after a UN rights panel declared that Nasheed’s jailing was arbitrary, the government last month authorised a 30-day medical leave for the opposition leader to undergo surgery in England after a concerted lobbying effort by India, Sri Lanka, UK, and US. Nasheed has said that he intends to the return to the Maldives and challenge Yameen in the 2018 presidential election. But the opposition leader will only be able to contest the election if the apex court overturns his terrorism conviction. Last month, UK Prime Minister David Cameron said his government is prepared to impose targeted sanctions on top Maldivian officials if Nasheed and other jailed politicians are not released. Nasheed’s heavyweight international lawyers Amal Clooney and Jared Genser have also won support from US lawmakers for a resolution on targeted sanctions. The government had invited the MEPs “to examine the details of specific cases that MPs had expressed concerns, or send experts with technical capacity to examine the details of such cases, before making sweeping conclusions,” the foreign ministry said.